Just when I am starting to think business cards are a thing of the past, I have been proven wrong more times than I can count. Who needs a business card when you have an Instagram account? Perhaps it’s a generational thing, but there are still millions of people out there who like to have a tangible reminder of who you are & what you do. If I leave the house without a business card in my purse, I am guaranteed to get asked for one (and vice-versa…no one ever asks for a card when I’m all stocked up). Even if you rarely use your business cards, you never know who you might come into contact with when you’re in line at the grocery store or out on a walk around the park. One of the best sources of referral is through word of mouth, and this is especially true for wedding photographers. More than likely, each bride and groom you work with has a college roommate, work colleague, or friend of a friend who is getting married in the near future. Let’s pretend, for a minute, that your client runs into a few old friends at a college alumni event. These long-lost pals, two of whom are now engaged, saw your client’s wedding pictures on Facebook and want to know who took the beautiful images. They are looking for a high-end wedding photographer in their area but don’t feel comfortable making such a large investment without hearing first-hand experiences about that vendor. Your client gives their friends the name of your business, but it is quickly forgotten after the couple returns home. In a perfect world, your client would have given you credit as their photographer on social media, but, as you know, this doesn’t always happen. Make sure potential & existing clients remember your name by creating a unique business card for your business. For such a small amount of space, there are a lot of creative ways to use a business card design to your advantage. Not a phone person? We are right there with you. If you don’t like the idea of having clients text or call you at all hours of the day, leave out your phone number and put your email address on your cards instead. That being said, if you are a photographer, your clients probably want to have a chat either by phone or in-person before they book. The quality of your cards is a reflection of the quality of your work. It won’t do you any favors to get the cheapest cards on the web. Hand out several cards to clients at in-person meetings so they have extras for their parents, siblings, and friends. As you hand your card to someone, tell them a quirky detail about you that will help them remember your name and/or the name of your business. If you are active on social media, include your Facebook or Instagram handle. Include an incentive to encourage referrals from existing clients (ex: refer a friend & receive 10% off printed products). Attach a few cards to your welcome packets along with your price list, contract, or welcome magazine. Don’t feel obligated to include photos - some of the best business card designs are the ones that are the most minimal (think simple text + colors). If you do include photos, make sure the lighting and colors are consistent with the rest of your branding (3-4 photos are plenty…don’t get crazy trying to stuff a dozen images into a teeny tiny space). After handing over a card or two, ask for the other person’s card in return. This will show this person that you are genuinely interested in them and what they do for a living. If they don’t have any cards, it will be a good reminder for them to refill their business card stash. Once you make initial contact with someone you want in your tribe, follow-up by adding them on Instagram or Facebook. It will remind them of your initial meeting and will allow this person to receive future updates from you and your business. 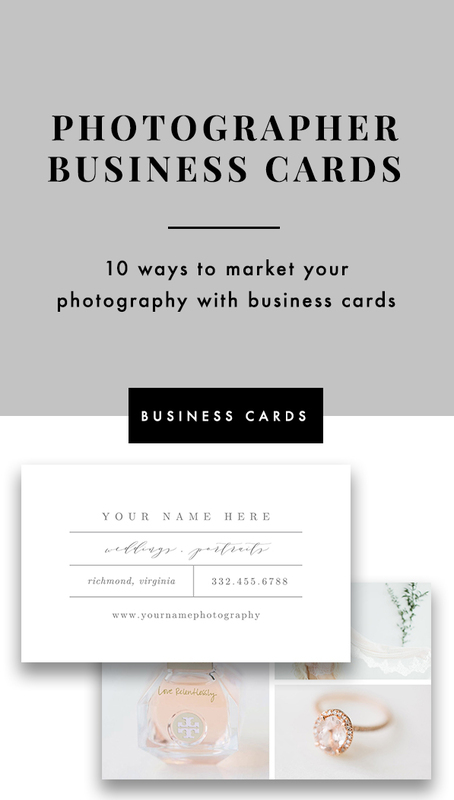 These business cards are perfect for portrait & wedding photographers as well as calligraphers, wedding planners, and graphic designers who are looking to showcase their work within a beautiful design. All text, fonts, and colors can easily be updated within Photoshop.